Thank-you Santa, I have spent wisely the John Lewis vouchers you left me! 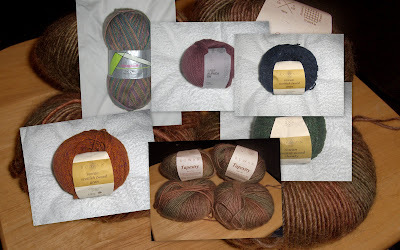 Thank-you also Flavaknits Santa who gave me some lovely sock wool, just my colours, at our Glasgow Knit n Stitch party in December. Photos can be clicked on for details and close-ups. Bring on a fab year of knitting in 2009! Have fun knitting with all your lovely yarn! Yum! Especially love the colourway of the Rowan Tapestry!